Czech beads have, in recent years, excited many a beader with the increased number of different kinds of beads. That means there is an explosive number of design possibilities! There is something for everyone. 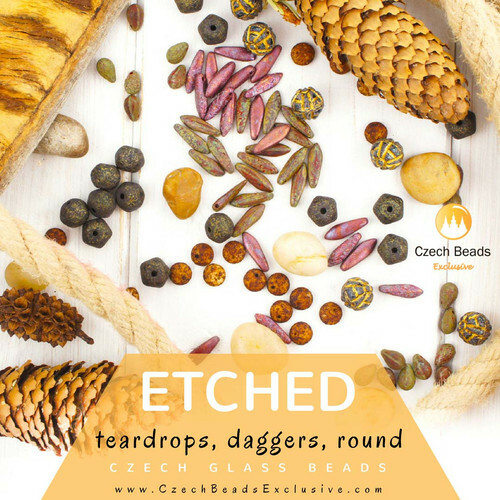 I introduced Czech Beads Exclusive before as they do have some fun tutorials over on their blog. I try and share my favorites from time to time! 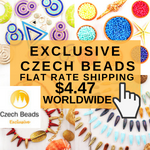 Czech Beads Exclusive is based in Prague, the capital of the Czech Republic. 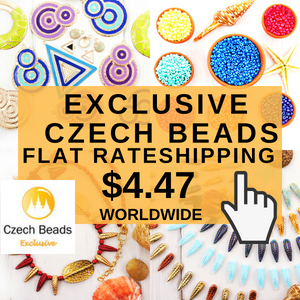 They are able to stock directly from the many Czech bead makers in the country. But they sell internationally. I really like their flat shipping rate. 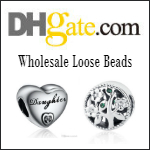 Explore their store (they are also on Etsy) and see the tremendous range of beads etc they have. I have picked a few of my favorites. Also well worth noting are their useful calculator pages. 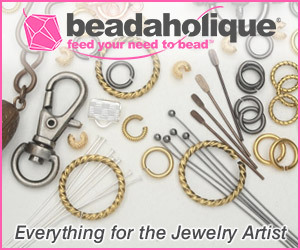 The Bead Project Calculator determines how many beads of a certain you need for your desired bracelet or necklace length. The Seed Beads Hanks Calculator/Gram Calculator is particularly useful as you input weight or hanks and see how many beads you get - even the dimensions and weight of each bead. 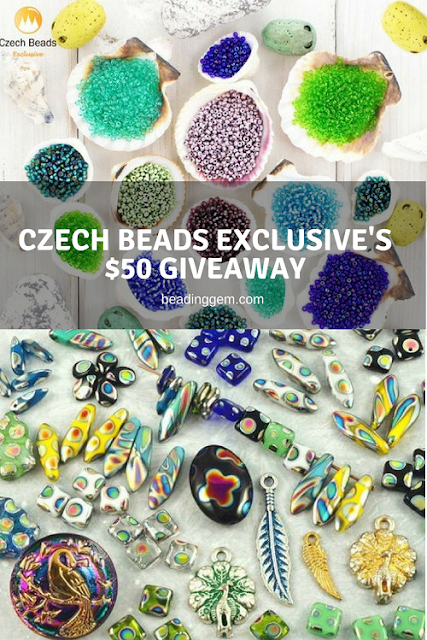 If you'd like to win this giveaway for $50 worth of scrumptious Czech beads from Czech Beads Exclusive, please make a comment below. Make sure you leave contact info below if you do not have an online shop or blog. It ends in a week's time at 6 pm EST Monday, August 6, 2018. I will pick the winner randomly and announce the results as soon as possible after. So be sure to leave a contact email if you don't have an online link or make sure you come back and check! Otherwise I will redraw in a week. Good luck! What eye candy!! I have a real soft spot for Czech buttons, but all of those beads are beautiful. Wow. I havent' seen most of these yet in real life. They look gorgeous. Love your work!! I would also love to win some beads, they are always welcome!! Oh wow! This Czech give away would ge awesome! Such a fabulous variety of beautiful beads here!! Thank you! I have been ordering from Czech Beads Exclusive (through their Etsy shop) so much lately -- probably 3 or 4 times in the past 2 months. I also get their monthly bead subscription box, which is really nice and packed full of items. They have a lot of shapes I haven't seen anywhere else. I am a big fan! Thanks for showing us the wide variety of designs they offer! I would, of course, love to win the gift certificate! Oh, what fun things I could make with these goodies! Thank you for offering this fantastic giveaway! Wow, would love to win this...Czech glass beads are amongst my favorites. Thanks for giving us this opportunity Pearl! I'm amazed at the variety of beads available. I simply had no idea. As a non-beader I had assumed that there were just the run-of-the-mill beads out there - seed beads and made a little bigger. But I see a large variety of beads I'd use here. How exciting is that! I love their beads! 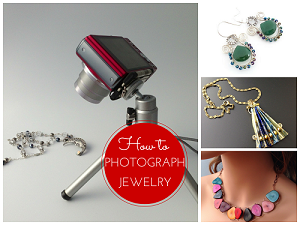 I'm just planning my new Fall jewelry projects and would love to have some of these delightful beads to play with! Dear Pearl thank you for a nice review! Beautiful, I can only imagine all the fun you could have creating with this much variety! I adore Czech glass beads, use them all the time. Winning this giveaway would be like manna from heaven! These are my favorite beads. I would love to make something with them. What a treasure trove of shapes and colors!! I would love to be able to create things with these!! 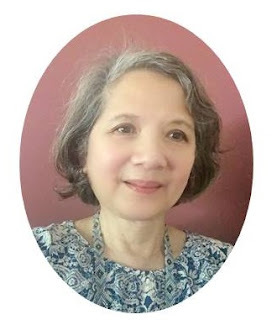 Thanks Pearl for bringing another great giveaway opportunity to your readers. Hope you are having a good summer. Blog Subscriber. OOOOOh Awsome ! 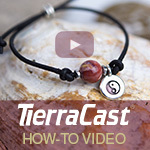 This is a GREAT giveaway ! I am a follower , and very happy to try my luck here !!!! Soo much choice ! What a wonderful giveaway! Please enter me! 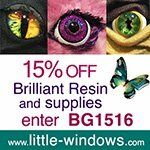 Love their vibrant colours and quality products. I have been a subscriber to this store for a year now but have never tried them out. Thank you for the opportunity to win some great looking beads! I have been in love with Czech Beads ever since you introduced me to them. They have a lovely selection, and send out some really great emails that always include beautiful projects. I would absolutely love to win a gift certificate! I love love love Czech beads. And I am a subscriber. Oh those feathers! What I could do with those. The buttons are lovely. Would be great to win so I could purchase some buttons too. Wonderful giveaway! Czech Glass Beads are awesome... Thanks for chance to win them. Pearl, I enjoy your blog every day. Greetings! Thanks Pearl - The explosion of new Czech Beads has been very exciting and will, no doubt, have a great impact on bead work for years to come. I've seen many of the new Czech buttons, and they are very well made. 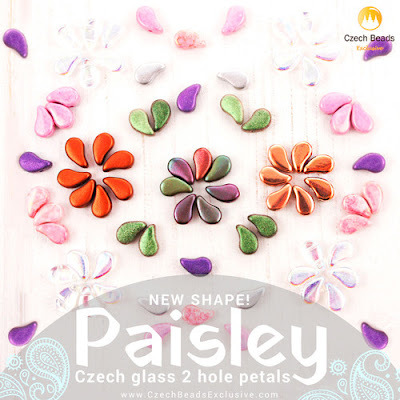 It's good to see the resurgence of the Czech glass bead and button industries. Pearl! These beads are so great in so many things. I love uszing them with lampwork. Such great colors and shapes. I’m a subscriber and follower. Pearl you're awesome, you have the best giveaways! The beads from Czech Beads Exclusive are amazing! 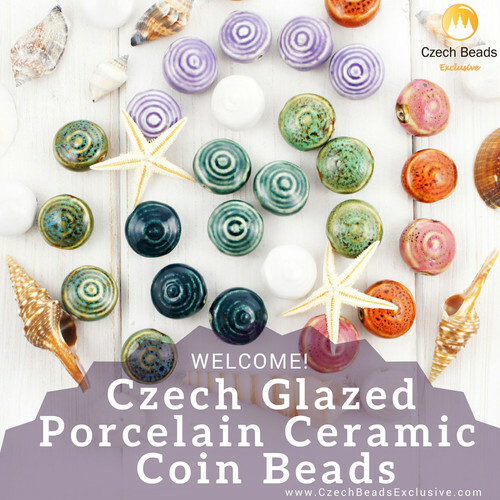 Czech is always coming up with new bead designs that continue to spark our creativity. I really don't know how they can do them all. I didn't even know that they had the feathers or the glazed coins. I want to get my hands on them now! Thanks for the information about how to use the website and shipping information, you took the looking for answers out of the search. Now all we have to do is fill up a cart with beautiful beads. I like the new shapes and the particular colors. Surely they will give million of possibility to express beaders fantasy and ability.Thanks to Czech Beads Exclusive!!! They have a good selection of beads. 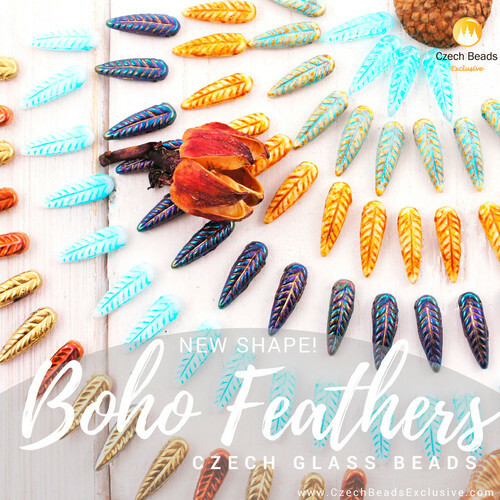 Czech glass beads are exceptional. I have ordered some online as our stores don't carry a big variety and it was rather difficult to pick just a few types of them :) I am a blog follower! These Czech beads are gorgeous! Sich variety! Thank you for the chance to win them! Beautiful and versatile! Thank you for this giveaway! LOL! If this giveaway was determined by the answer that got a chuckle out of me, this would be the winner! Alas, Cathy, it will be down to plain old luck via a random number generator! These are by far my favorite beads. Thank you Pearl for the opportunity. Blog follower: zoowatcher10@yahoo.com. I am just drooling over all the lovelies——Wait, let me dry off my screen!!! THERE!!! Oh how I just love The Czech Republic and their talent for all things beadie and beautiful!!!! Thanks to you for this contest and thanks to The Talent of the Czechs!!!! I am just regularly bowled over by the variety of all the lovelies!!! Have a great day and Thanks again!!!! I would love to have more Czech beads in my stash. Thanks for the opportunity, Pearl! I am a subscriber to your blog. WoWza! Gorgeous beads. I would love to win. Thanks for hosting another wonderful giveaway Pearl! Always loved Czech beads.My birthday month .Would be awesome to win. It would be awesome to win that gift card! Thanks for the giveaway! So many pretties to play with. Thanks for the chance to win. It would be so much fun to win all these pretty beads for my friend Neri. I buy beads for her to make her jewelry to sell. Thank you for this give away. The mind boggles with ideas. Beautiful beads! Would ❤ to win! Wow - they are all so beautiful!! Thanks for the chance to win!!! These are super pretty, could do a lot with them! these are so beautiful! I would be so honored to make something gorgeous with these!